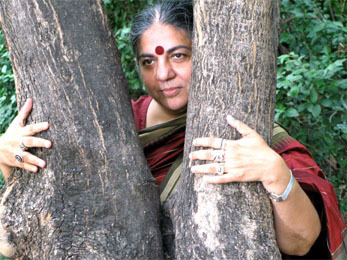 Filmmaker and sound designer Velcrow Ripper is followed by Vandana Shiva. from India, who is a Right Livelihood, UNEP and UN Award winning physicist, eco-feminist, environmental activist (Navdanya) and also a writer of several books, including Soil Not Oil. TIME-magazine called her "hero for the planet". To save ourselves. The earth is our only home and while it can survive without humans, humans cannot survive without her. As I have written in my book Soil not Oil, protecting and growing biodiversity and growing food organically can solve 40% of the climate problem while increasing food security. We are children of the earth, born of her soil and water, her water and air. We are part of her. Being green is recognizing that basic fact. We can and must all be Green if we are to survive as a species. Music is the language of the heart. We need a change of heart. Music can play a big role in a shift to ecological ways of being on this planet. Next up is 'The World Without Us' author Alan Weisman.